Come visit Santa and his helpers at the Sheraton Steamboat Resort. Enjoy chocolate chip pancakes, cheesy eggs and potatoes, bacon and sausage, fresh fruit, and the hot coco bar. Write a wish list to Santa and get your picture with the big man himself! So to celebrate our devious side, Butcherknife Brewing Company decided to host an “Ugly Christmas Sweater Party” guest starring none other than Bad Santa himself. A live theatrical production based on the popular Junie B. book series by Barbara Park. Junie B. Jones, the world’s favorite first grader, will steal your heart and brighten your spirits with her Secret Santa saga this holiday season. Barbara Park, the author of the Junie B. Jones chapter book series, has received more than 40 awards for her books, including 25 Children’s Choice awards. 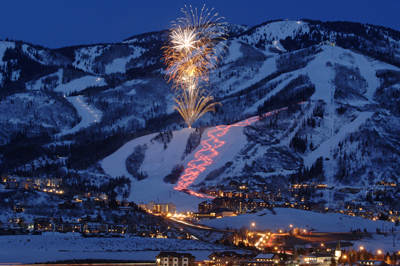 The Steamboat Ski & Snowboard School treats tourists and locals to a spectacular on-snow parade down the mountain lit only by torches for this New Year's Eve event. In conjunction with the torchlight parade, a fireworks display will illuminate the sky providing a perfect ending to the evening. The show is free and great for all ages. The best viewing is from the pavers at the Steamboat Stage and the Umbrella Bar next to the Bear River Bar & Grill, all adjacent to the Steamboat Gondola at the ski area base. Take the gondola and Celebrate New Year’s in the Champagne Powder Room, overlooking the Yampa Valley and the sparkling town lights below. Dance the night away to the music of Sundog and make merry with a balloon drop and Korbel® toast to ring in the New Year. Festive libations are available throughout the evening including a complimentary desert bar, chocolate fountain and dim sum appetizer station. Tickets are $30 per person and includes gondola ride. Cash bar available. Korbel New Year’s Eve Party is included with all on mountain dining reservations on New Year’s Eve including Ragnar’s Sleigh Ride Dinner, Four Points Dinner, Hazie’s Dinner and Western BBQ.